John Unger carries Schoep to the water each night. Photo by Hannah Stonehouse Hudson. 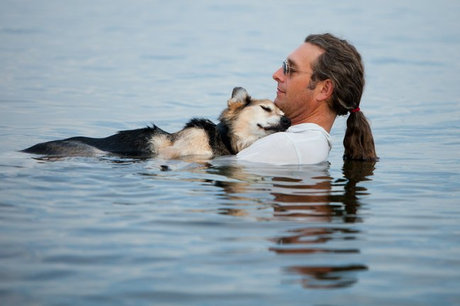 A photograph of a sweet moment between John Unger and his 19-year-old dog, Schoep, is touching hearts across the web this week. The photo shows Unger and Schoep wading in the soothing waters of Lake Superior, the old dog’s head resting on Unger’s shoulder. Bayfield, Wisconsin photographer Hannah Stonehouse Hudson captured the peaceful moment. “In the shot, the dog is completely relaxed, with his head on John’s shoulder, eyes closed, out cold. John’s eyes are closed, too. The water is calm. It’s completely serene,” Hudson described. When Hudson posted the now famous photograph on her company Facebook page August 1, it became an instant sensation. Nearly 30,000 comments and 260,000 “likes” later, it’s clear that the photo Hudson took is more than just a portrait of a man and his dog – it’s an entire love story in a single frame, a silent moment that speaks volumes to everyone that views it. Hudson, who has known Unger for six years, felt honored to capture the beautiful relationship between her friend and his dog. Unger adopted Schoep when Schoep was an 8-month-old pup. Now at 19-years-old, Schoep suffers from arthritis. Unger explained to Hudson that Schoep loves the warm lake waters because they are relieving on his sore joints. “He’s so relaxed he just falls right asleep,” Hudson said of Schoep. Schoep’s arthritis has grown more severe, and though his veterinarian has prescribed pain medication, the old dog sometimes limps while walking. Unger told The Duluth News Tribune that when Schoep is unable to get up without being in pain, it will be time to say goodbye to his four-legged friend. “What was going through my mind when Hannah was taking those pictures was that this may be the last time I’m going to be swimming with him,” Unger said. “I want people to identify with this photo, and remember a time when they felt safe, loved, and cared for,” Hudson told The Huffington Post. “Then I want them to channel those feelings and pay it forward!” she added. Hudson never anticipated the impact that her photograph may have, but is delighted to be able to share it. “There is way too much negativity in this world—maybe with this one photo we can start to change things just a tiny bit,” Hudson added.